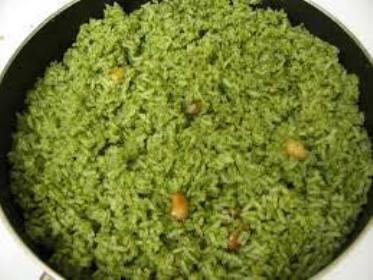 Palak Rice is healthy and flavourful rice dish made from spinach. Today, try this recipe and share your feedback with us. Heat oil in a pan. Add peppercorns, cloves and cinnamon and cover. When it leaves nice fragrance, switch off the gas, open the lid and put rice and sprinkle salt. Put spinach purée and coconut chutney and mix it well making sure that rice grain does not break. Start the gas again. Cover the rice and let it cook on a very low flame for 5 min. Or heat the tawa and put the pan with rice on the tawa and let it cook for 10 min.